AUSXIP Renee O'Connor News - AUSXIP Charity Auction Upcoming ROC Autographed Pics and Poster! AUSXIP Charity Auction Upcoming ROC Autographed Pics and Poster! It was an awesome weekend (even though I couldn't attend the Tampa Comic Con where Renee was on the weekend) She signed autographs, did a Q&A, photo ops and more. Renee was also busy making me every happy by donating some autographed photos AND a gorgeous poster. Check them out below. The auction will be held in March 2018! 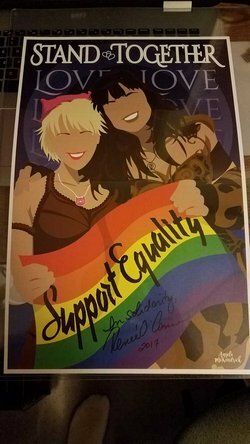 This art poster about Equality was being sold at the comic con. Renee bought, signed and donated it for the AUSXIP Charity Auction - THANK YOU RENEE! We will also have several copies of these posters that are not signed. ALL money raised will be donated to AUSXIP's official charity: Starship Foundation in New Zealand! ROC ON! and Renee also donated and signed these photos! !